The European Championship (Division B) was held between October, 19th and 24th in Denmark. What happened there? The upward trend of the bulgarian goalball is undoubted in the last few years. This conclusion mainly refers to the national team and the team of “Vitosha” Sofia University. 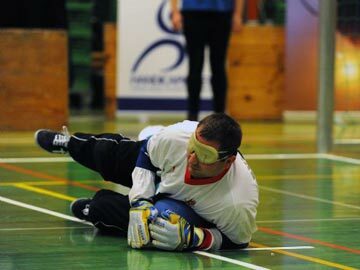 The first participation of the Bulgarian national goalball team to an european championship, after revivaling of this sport in Bulgaria, was in Turkey 2007, where the team took the fourth place after loosing dramatically the mini-final against The Netherlands, receiving a golden goal in the extra time. 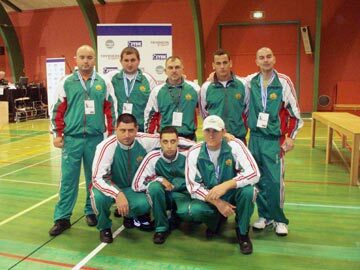 In 2009 the Bulgarian national competitors played on a very high level at the European championship, held in Portugal. And here as well the national team lost the semi-final against The Netherlands with a golden goal in the extra time. Bulgaria took the third place. The good achievements allowed the Bulgarian national team to move up to the higher Division B. The European Championship (Division B) was held between October, 19th and 24th in Denmark. But the way of the Bulgarian national team to Assens, where the championship was held, wasn’t carpeted. As usual a great persuasion started that this is a new step forward in development of Bulgarian goalball and participation of the national team is of significant importance. In return there was just the well-known burden: “No money.”. Although plenty of hindrances and owing mainly to Sports Club for Integration “Vitosha” and The Bulgarian Paralympic Association, the participation was covered. In months of June and July Sofia University “St. Kliment Ohridski” gave access to its sports hall in The Faculty of Biology for the goalball players to practice. The university’s train center is in a bad need of overhaul, but this would hardly happen in the near future. In August and September they trained in the basketball hall of The National Stadium “Vasil Levski”. Once a week the team exercised in the fitness centre of The Bulgarian Paralympic Association. From September, 22nd to October, 3rd the national players had a training camp at the alpine sports base of Belmeken. After the camp the team continued practicing in Sofia having limited access to the hall of The National Stadium. This year the national team consisted of: Ivan Yanev – captain; Alexander Stoyanov, Dobroslav Iliev, Ivaylo Vytov, Nikolay Zhelyazkov and Veselin Kushnerenkov – players; Deyvis Vidolov – coach; masseur and assistant – Mihail Iliev. In the end of July Hristo Zhelyazkov got a serious bruise that expelled him from the team. Although his team-mates cherished hopes he’ll manage to recuperate, that didn’t happen. The contusion was serious – at a training he tore a finger ligament and although assurances of the specialists in Pirogov he’ll quickly recover, finally he dropped out of the group. On October, 19th early in the morning, the Bulgarians started on for achieving the next goal. And the goal was clearly stated – remaining in Division B. All teams were accommodated in two-storied houses on the coast. On the first floor there were the kitchen and the sitting corners and the laundry with a drier as well. The kitchen was perfectly equipped: a dish-washer, a fridge, a cooker, a microwave, a coffee-machine and in the cupboards there were all the appliances required. There were three bedrooms and a large bathroom on the second floor. Every morning at 6:30 breakfast was delivered to the houses for all the participants at the competition. Rest of meals were taken in the sports centre where the championship itself was held. The sports centre was situated near by the place where the teams were housed. The team had an official training on 20th of October. This was the first time training hours were foreseen for all the teams. That’s how the competitors got familiar with the texture they had to play on. There are ten teams in Division B. The teams at the championship were divided in two groups of five teams each. There were also two halls on the textures of which games were held. Bulgaria was in a group with the teams of Denmark, Italy, The Netherlands and Turkey. The other group consisted of the following teams: Finland, Germany, Israel, Russian Federation and The United Kingdom. The first match of our nationals was against the hosts. It started at 9:00 on 21st of October. The match began contendly but the danes dominated the game in the first half. During the second half the Bulgarians gradually started playing better but finally the danes won 9:6. The next match of the Bulgarians, versus The Netherlands, was at 15:00. The two teams entered hard in the game. The Bulgarians had to give it back to the dutch hot and strong for the previous two championships. But disappointment was again with our boys because the result 5:4 was for the opponent. Should be remarked that four out of five goals for the dutch in this game were scored from penalties. Seven penalties were given against Bulgaria in this match. The last game for 21st was at 19:00 wit the Turkish team. The match was quite hard in the beginning. In 2007 at the European championship the Bulgarians won 8:2 but then Turkey become a champion and entered Division Be where successfully stood its ground. The game was more than interesting but in the second half Turkey managed to advance 4:2. The Bulgarians didn’t have much time left and realized that another loss dramatically reduces their chances. So after a strong Bulgarian offensive the final result reached 4:4 and first Bulgarian point at the championship. The match on 22nd was against Italy which managed to win only The Netherlands the day before and had three points. The Italians could satisfy with an equal game while the Bulgarians badly needed the victory, if they wished to go out of the group. The crucial match started at 12:00 and offered incredible emotions because both teams fought and wanted the victory. Strong hits, good blocks and lucky cannons took turn and fortunately the result was 5:3 for Bulgaria. So taking the third place in the group Bulgaria faced in the quarter-final Germany which took the second one in the other group. The next dramatic game in a row started at 18:00. After the beginning non of the teams received a goal in the door. Anyhow the germans were first to be cracked and Bulgaria advanced 1:0. Germany managed to equalize until the end of the first half. The second one started 1:1. The germans managed to score a new goal and advanced 2:1. The Bulgarians didn’t give up and equalized. A few seconds before the end of the game the referees gave a penalty for Bulgaria. The same referees saw a breach of the rules performing the penalty, cancelled the penalty goal and gave a penalty for the german team. Fortunately the penalty was kept and the equal result remained unchanged. Two extra time halfs were forthcoming, the golden goal rule – a serial championship for the Bulgarians to face this challenge. Germany scored the priceless golden goal after all and the Bulgarians couldn’t believe the same foreboding is still chasing them. Bulgaria could enter Division A because the first four teams enter the upper division. But the reality was different – the team remained to play and fight for the positions from five to eight. On 23rd, at 9:00 the Bulgarians faced again the Italians and this time as well did a very good game. Whoever had have won, it wouldn’t have been unfair. Finally the Bulgarians lost 2:3 and stepped backward and had to fight for the seventh place, the last one to give right to remain in Division B, cause the following ones drop down in Division C.
The match for the seventh position was versus Israel, the champion from the Euro Cup in Portugal 2009. The game began at 13:00 and offered dramatic emotions for both of the teams as well. The first half was equal (5:5) and nothing was decided yet. In the second half the Bulgarians managed to win (9:8) and achieved the main objective for the championship. Undoubtedly The MVP in the Bulgarian team is Veselin Kushnerenkov to score twenty goals. He shares fourth place with two more players and has eight goals less than the best scorer. The next ones in the Bulgarian team are as follows: Dobroslav Iliev (five goals), Nikolay Zhelyazkov (four goals), and the young Alexander Stoyanov (three goals). The successful debut of the new coach of the Bulgarian goalball team Deyvis Vidolov deserves to be remarked. He did went out his way, for the short period (a month and a half) to deal with the team. He had to synchronize and motivate the boys in order to achieve good results and the goals set. The Bulgarian team left for home on 24th and on 25th touched successfully down in Sofia. 1. Rejuvenation that is currently being done in the national team should be continued. 2. Training should be regular but not sporadic. 3. International contacts of the team should be widened such as for the coaches and referees. 4. Development of goalball should be done in the schools. 5. The aim to achieve for the next European Championship in 2012 is a team consisting of young players. 6. The aim to set in front of the rejuvenated team is remaining the place in Division B.
Bulgaria could be satisfied with the representation of the national team at this European Championship. This is another consecutive historical step for our goalball. Bases are getting solid and from now on should be upgraded and the right direction is only straight forward.